Germany is a highly developed nation with population of more than 80 million. There are numerous online shopping websites which have come up in the recent times in Germany. Just like any other country in the world there are several websites which are available for the German people as well. 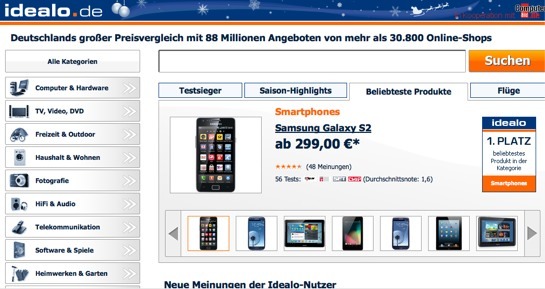 Here are top German website for shopping online. They’re ranked based on popularity within country. Related Lists: (1) German News Websites (2) German Universities (3) UK Shopping Websites. eCommerce giant amazon.com offer a huge collection of varied items such as clothing, shoes, fashion accessories, jewelry, home appliances, electronics, sports and leisure items. The website features promotional offers and discounts by leading brands from time to time. Ebay is one of the top auction websites across the world. Their german website offers products that range from fashion accessories and move on to household appliances, furniture, electronics, jewelry, sports goods, and a lot of other items. While there are daily offers, the website offers attractive deals and special offers too. The website offers a comparative shopping services including features and prices of mobile phones and other consumer electronics from all the internationally reputed brands. Electronic items and household appliances from reputed brands are offered by idealo with attractive discounts and offers. This online retail store is promoted by the Otto GmbH group and has been popular as world’s leading mail order company. The store offers home appliances, furniture, electronics, and clothing, besides other items. The company is operating in more than 20 countries in the world. Zalando GmbH is a popular e-commerce website that specializes in selling shoes, clothes and other fashion and lifestyle products. Found in the year 2008 it has offered its retail services to expand across to more than 10 European nations. DaWanda is a marketpalce of handmade products. The site has been live since 2006 and allows users to sell products that include clothing, accessories, bags, jewelry, baby items, toys, etc. The site besides being in German is also available in English. The website covers every requirement for households including furniture and other home appliances. The modes of payment are flexible that includes payment through girocard and offers money back options. The site is exclusively available for the people of Germany. It ships the products available on the website only to the people within the country. They feature products ranging from the everyday use category to the big office furniture. This website is the official site of Conrad which has been catering to the needs of its customers for more than 85 years. Their site features consumer electronic products and products used in the auto industry. Popular for its chain of coffee shops and cafes across the country Tchibo is known for its weekly changing range of products. Their online store features products that include clothing, electronics, household items, etc. The products that you can get here include electronic products such as the television, computers, and other gadgets. The site features late night countdown where people are offered additional discounts. Rakuten is a brand from Japan and is present as an ecommerce company across the globe. To expand its presence in the country it started off from Tradoria with its range of products. The website specializes in offering PCs and notebooks. There are several products available from leading brands and manufacturers on the website such as Asus, Microsoft, Lenovo, etc. This site offers comparision shopping service and also present in many other countries. They have millions of members who test the benefits of products and services offered by different brands, provide reviews and more. This is yet another comparison shopping website which features products from virtually every category. It has more than 50 million licenses for more than 1.5 million products and services that provides strong platform for price comparison within Germany. Esprit is a leading clothing brand. Their online store in Germany features a place for all men, women, and children with fashionable and trendy clothing. The apparels are filtered in accordance with different seasons and occasions. The brand has 27 million customers across the globe and is available in 25 different countries. The brand initially setup in the year 1986 features a huge collection of apparels for men, women, and children, besides a vast collection of footwear, accessories, sportswear, swimwear, etc. The website is a shopping directory which is accessed by the locals in Germany for the variety of products offered. The site features huge section of lifestyle products which include fashion bags, jewelry, watches and more. Found in 2007 and based in Berlin, The site has been popular as a closed shopping community online. The site comes up with offers that allow the consumers to save up to 70% on the products. This is a St. Georgen (Germany) based marketplace, which offers eBay like service to online retailers. Sellers can create online shop and put their products through shop. The site is online since 2003.